1. Dual piston rack and pinion design of symmetric structure for fast and smooth action, high precision and high output power. Reverse rotation can be accomplished by simply changing the mounting position of the pistons. 2. Extruded high-quality aluminum alloy cylinder block, precisely processed inner hole and hard anodized outer surface (anodicoxidation under special circumstances+ Teflon coating) extend the lifecycle and lower friction confficient. 3. 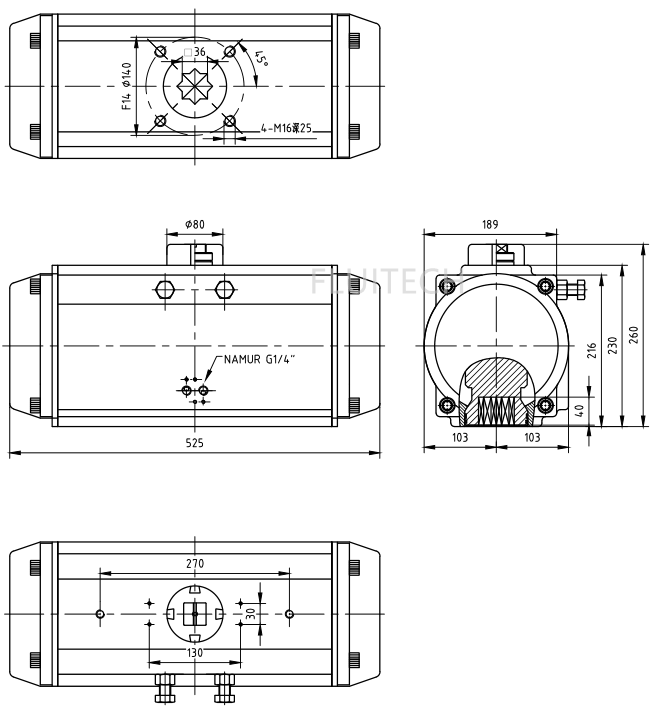 Uniform design utilizes identical cylinder body and end cap for all double acting and single acting actuators. It allows changing acting way easily by adding or removing springs. 4. Modular preloaded safe spring cartridges can install or remove springs easily and safely no matter in the process of mounting or in the field. 5. The two independent adjusting screws on the external side can precisely adjust the on/off location of valve, which has been installed with actuator. If full stroke adjustment is required, additionally install longer adjusting screws on two end covers. 6. Multi-positioner and visual indicator comply with standard VID/VIE 3845 and NAMUR able to install and output all accessories. 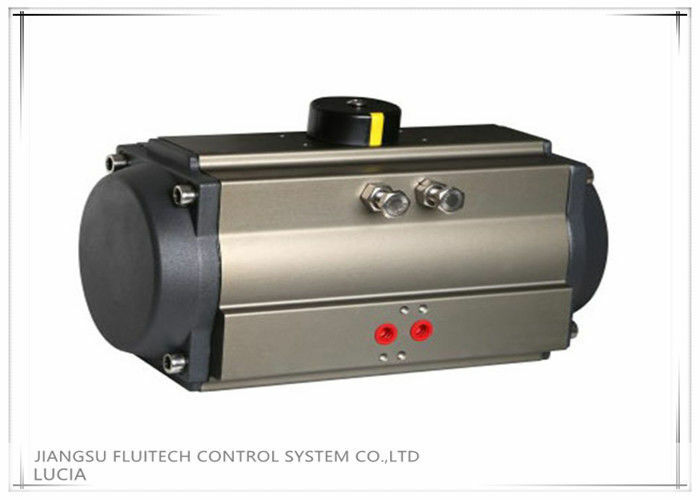 Such as limit switch, positioner and position sensor. 7. Air port complies with NAMUR standard and can be directly mounted NUMAR standard solenoid valve. 8. The compound bearing bush and piston guide ring at the back of gear rack and bearing of outlet shaft prevent metal to metal friction. In addition, the increased lubricants help to reduce friction and extend the lifecycle. 9. All fasteners are made of stainless steel material and long-term corrosion resistance. 10. Fully conformance to the latest specifications of ISO5211, DN3337(F03-F25), Namur and make the installation interchangeable and versatile. We are a factory specialized in manufacturing valves and fitting over 17 years. And we have got the verification of compliance for ball valve from ECM and ISO9001 certificate of manufacturing and processing of valves and fittings. We hope to make business with companies from all over the world. And for now, our valves and fittings have been exported to especially in North America, South America, South Asia, Europe and Middle East. 3 Do you have a minimum quantity of the products? No, we will build business with you with even 1pc. We believe this cooperation will be a long-term relationship for our high quality, competitive price and good after-sale service. 7 How can I check your factory situation while it's difficult for me to come to China? We also have a showroom in CA, USA. If you have time, you can take a look. First of all, we have the numerical control device to manufacture products accurately. Then our quality inspectors will test products one by one to make sure every valve or fitting we sell is qualified. 9 How long is the quality guarantee period? We supply 6 to 12 months for quality guarantee according to customers' using frequency.